Here it is, my first photo of 2015 taken on 02 January 2015 before going to work i stopped at the old Canal Soulanges in Pointe-des-Cascades. I like that place in winter, the scenic varies depending on the temperature, as it gets colder the ice get thicker. I liked the directional pattern the ice took this time, probably from the mist coming from the waterfall that is just outside the right side of the frame. 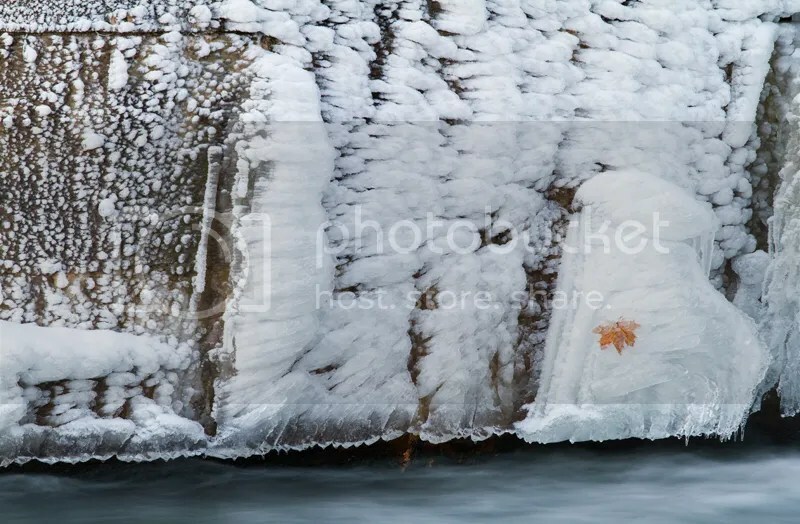 As a final touch i placed the Maple leaf caught in the ice near a strong point of the rule of thirds. Taken with Canon 7D and 70-200mm/4 L at 200mm, 1 second at f/13, tripod.